Died of enteric fever at Norval's Point. 25th Feb. 1901. Aged 29. Awarded the D.S.O. in 1901. The son of Major-General H.R. Abadie, CB (Lieutenant-Governor of Jersey). Born June 1872. Joined the 11th Hussars in October 1892. Served at Chitral (medal and clasp), North-West Frontier and Tirah (medal, 2 clasps, MID), South Africa (medal, 5 clasps, MID, DSO). During the siege of Ladysmith he served as 'Staff Officer for Water Supplies'. Memorial at Colesburg Cemetery, South Africa (grave no. 41) - "In Memory of the following Officers, NCO's & Men who fell in this district in the Anglo-Boer War 1899-1902.... 41 Cpt. H.B. Abadie 11th Hussars 25.2.1901." Killed at Syferfontein Farm. 8th Feb. 1902. Aged 25. Born in 1876, served in the Cape Mounted Rifles until May 1900. Killed at Wagon Hill, near Ladysmith. 6th Jan. 1900. Died of enteric at Bloemfontein. 2nd June 1900. Aged 29. Born 6th Feb. 1871, joined the army in Jan. 1899. Served in India until Jan. 1900. Killed at Tweefontein. 25th December 1901. Aged 25. Born 29th March 1876, son of T.F.A. Agnew, of Liverpool. Awarded the DCM. Commissioned in March 1901. He was buried near the battlefield, but his remains were exhumed and moved to Harrismith cemetery in 1958-1959. Killed at Diamond Hill. 11th June 1900. Aged 44. The Earl of Airlie, Scotland. Eldest son of the 9th Earl of Airlie and Henrietta (daughter of Lord Stanley). Born 20th Jan. 1856. Joined the army in June 1874. Served in Afghanistan 1878-9 (with 10th Hussars: medal and clasp), Egypt 1884-5 (medal and 3 clasps, Khedive's Star, Medjidie 4th class, MID, wounded at Abu Klea). Husband of Lady Mabel F.E. Gore (daughter of the Earl of Arran). He was also honourary Colonel of the 3rd (Dundee Highland) Volunteer Battalion, Black Watch. ALDERSON - Captain James Beaumont Standly - 1/Royal Irish Regt. Died of wounds 7th July 1900, Bethlehem. Aged 31. Born July 1869. Served at Tirah 1897-8 (medal and clasp). Killed near Paardeberg. 18th Feb. 1900. Aged 44. Awarded the DSO. Son of Colonel Robert Aldworth (ex-94th Foot and North Cork Rifles). Served in Burma 1885-6 (medal and clasp, MID, DSO), Chitral 1895, Tirah 1897-8 (medal and 3 clasps). Memorial at Cheltenham, Gloucestershire - "This memorial is erected in memory of those Cheltenham men, who, either as regulars, or volunteers, died in their country's service, during the South African war, and on the side panels hereof are recorded the names of those Cheltenham men who volunteered, and served in the war..... Lt. Col. W. Aldworth, DSO (D.C.L.I.) ..... Unveiled by Lt. Gen. Sir Ian Hamilton, K.C.B. 17th. July 1907. W. Nash Skillicorne, Mayor. Killed at Metz Farm. 15th May 1901. Aged 21. Son of George Alexander, of Goudhurst, Kent. Born May 1880. He was in Argentina when the Boer War began and sailed to South Africa to volunteer. Killed at Diamond Hill. 12th June 1900. Aged 22. Son of Colonel W.J. Alt (22nd Middlesex Volunteers). Died of enteric at Boshof. 25th May 1900. Killed at Clocolan. 22nd Dec. 1900. Wounded at Zeekogart, 10th July 1901. Died the next day. Aged 27. Son of Staff-Surgeon James R. Anderson (Royal Navy). Born Sept. 1873. Died of dysentry at Salisbury Hospital, Rhodesia. 9th July 1900. Aged 30. Born May 1870. ex-Lieutenant in the Royal Highlanders. ANGELL - Lieutenant John Charles - Welsh Regt. Killed at Paardeberg. 18th Feb. 1900. Aged 26. Killed 3rd June 1901. Aged 20. Son of Colonel William M. Angus (1st Newcastle-on-Tyne Volunteer Artillery). Killed at Eland's River. 4th Aug. 1900. Killed at Buffelsfontein. 30th Sept. 1901. Wounded at Mafeking, 7th Dec. 1900. Died at Lichtenburg on the 9th. Buried in Lichtenburg Graveyard. 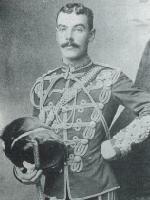 ARBUTHNOT - Captain Reginald Ramsay - Royal Irish Regt. Wounded at Ottoshoop, 20th Aug. 1900. Died at Mafeking 3rd Sept.
Died of enteric at Ladysmith, 9th March 1900. Aged 26. Son of Lieut-Colonel A.C. Arkwright, of Brentwood. Born March 1874. Buried in Intombi Cemetery. Killed in action at Vlakfontein. 29th May 1901. Aged 32. Son of Major Armstrong (late 16th Lancers), of Morville, Warwick. Born December 1868, joined the Royal Navy in 1884 and retired in 1890. Joined Lord Strathcona's Horse in Canada, commissioned in the Devon Company, 7th Batt. IY in August 1900. ARNOLD - Captain Henry M.R. - 2/Royal Canadian Regt. Wounded at Paardeberg, 17th Feb. 1900. Died of wounds on the 23rd. First Canadian Officer killed. Memorial at St. Catharine's, Niagara, Canada - "Major Henry M. Arnold, 90th Winnipeg Rifles, Capt. 2nd Special Service Battalion, R.C.R.I., died Feb. 23d, 1900, from wounds received in action at Paardeburg Drift. South Africa Feb. 18th, 1900." ATKINS - Captain William - Wiltshire Regt. Killed in action at Nooitgedacht. 13th Dec. 1900. Aged 39. Born June 1861. Promoted from the ranks (ex-Royal Irish Rifles). Died of enteric at Bloemfontein. 21st April 1902. Aged 27. Son of G.D. Atkinson-Clark, of Belford Hall, Northumberland. Born Sept. 1874. ASHFORDBY-TRENCHARD - Captain George Augustus - 5/Royal Irish Regt. Died of eneteric at Elandsfontein. 21st March 1902. Aged 32. Son of George, of Torquay. Born 1870. 2nd Lieutenant in the Lancashire Artillery Militia in 1887. Resigned in 1890 to go on the stage under the name George Hippisley. Obtained a commission in 1899. Wounded at Wagon Hill, Ladysmith 6th Jan. 1900. Died of wounds on the11th. Aged 36. Son and heir of the Marquis of Dufferin and Ava. Born 28th July 1863. Served in the 17th Lancers. In 1899 he went to South Africa as a War Correspondent. He was killed while carrying a message. He was a Fellow of the Royal Colonial Institute. Killed in action at Spion Kop. 24th Jan. 1900. Aged 25. Son of the late Major Awdry (Royal Engineers).